its a Great old school anime. the technique's used are in a league of its own, it will blow your mind. deception, treachery and the love of a good women all make up one of the best animes I've ever seen to date.. definitely check it out and see for your self!!! I love fist of the North star!! Its an old series but a classic. The fights are great and Kenshiro is the man. This series gets better especially when he starts to fight his other brothers. Its a fun series to watch and you won't be sorry if you watch it. 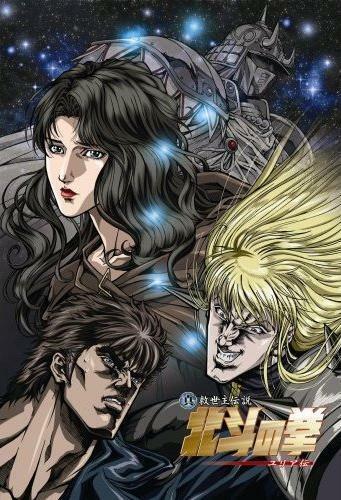 Fist of the North Star is Win. Omae wa mo shindeiru. I've seen all 152 episodes, and it's the greatest. No spending 10 episodes powering up for 1 episode of fighting then 2 more episodes of monologues and powering up again. Almost every single one of those 152 episodes is jam packed with fights and action sequences. Never a dull moment except for the frequent flashbacks, which are somewhat understandable if you were watching 1 episode a week unlike what I did watching several at a time. But I just couldn't stop watching. An art film of Bruce Lee in a blender full of Mad Max and chum. This is it, people. One of the originals. There are so many videogames, TV shows, and even other animations that copy elements from this show that it is a legend in its own right. Kenshiro, a man who lived his youth in an era of freedom and peace (the 80's, of course! ), trained as a martial artist in the Divine Fist of the North Star. A nuclear war broke out and he was one of the lucky folks who got to a bomb shelter in time. The premise of the show is that this lone warrior, Kenshiro, is wandering across the post-apocalyptic landscape trying to make his way in the world. While the world has degenerated into a fit of violence, chaos, and despair, he wanders the land with the heart of a giant attempting to right the wrongs inflicted by a myriad of post-apocalypse thugs. If you like a great storyline, well developed characters, and of course blood and gore. This is the anime you have been waiting for!!! This anime blends everything together to make a anime classic. Romance, drama, violence, curse words, and did i mention violence?!?!?! Kenshiro is the true definition of a man! The story was rich and the characters full of pride! If your into emotional, bloody, manly kung-fu action, then this is it! It's pretty old of an anime,being made back in the early 1980's but the most classical in my opinion. This breathtaking Japanese anime series has inspired anime creators like Eiichiro Oda, the creator of "One Piece" including Kohta Hirano, the creator of "Hellsing!" This series brought on alot emotions towards me to be honest, since innocent people die in nearly every episode!! Still...I highly suggest that you give it a try!! Weekly Shonen Jump's post-apocalyptic classic! Imagine an anime series starring the platonic lovechild of Bruce Lee and Mad Max from "The Road Warrior", and you get this series. SO [email protected]%$ING MANLY! WATCH THIS SERIES!